What are you doing this summer? Are you planning to take some time off with the family? Travel many miles and spend lots of money on hotels, gas and souvenirs? Many people are actually choosing to forgo traditional vacations and instead take advantage of the staycation! 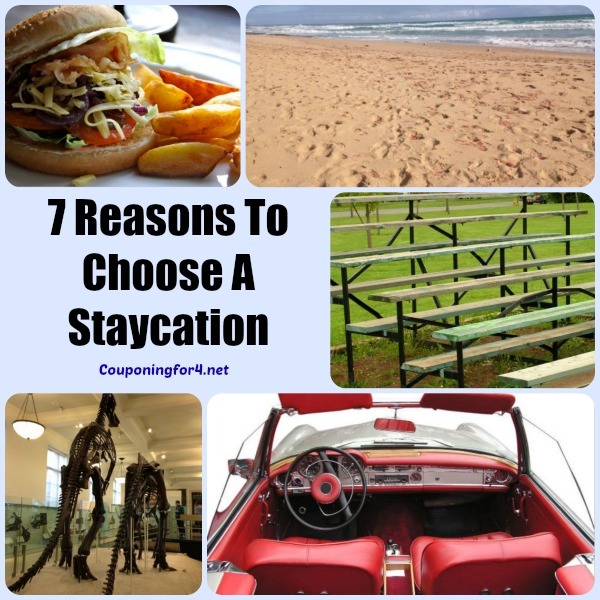 Let me give you 7 reasons to choose a staycation. You get to sleep in your own bed. There is a lot to be said about sleeping in your own bed instead of one at a hotel or motel. While you are considering the benefits of a staycation, you also want to think of how it will affect your physical health. If you have any back or neck issues, your own bed and pillows are much more favorable to a hotel. It also will help your children to sleep better and stay in their same routines much easier. You will learn more about your home state or city. This part is great for those who are new to a state, or perhaps just haven’t explored much yet. Being able to find that hidden waterfall, see a state landmark from the early days of statehood, or even go to that local dive restaurant that offers the best burger in town can all be great reasons to staycation in your home state or city. Ability to cater to dietary needs easily at or from home. One complication for many families with travel is the lack of easy access to diet friendly foods on the road. Whether you are gluten free, dairy free, organic or sugar free it can be costly and difficult to provide food for your family on the road. Lower overall travel expenses. By staying at home you eliminate the hotel costs that take up much of your vacation budget. Traveling only within your home state, and only within a few hours of home means you will have lower gas expenses as well. No need for house or pet sitter. This can fall under lower travel expenses, but also under that tab of general frustrations. Not needing a house sitter or pet sitter will save you money and stress while away from home. Being able to know that your pets and home are safe and cared for while you enjoy time with your family is important. More money to spend on entertainment. Saving on your travel expenses means you can invest more money into entertainment on your staycation. Local theme parks, matinée movie with your kids or even going to a local restaurant that is usually off limits due to cost can all be factored into your savings. This may be one of the best reasons to choose a staycation. Giving you the chance to do more due to the savings on your travel expenses will help create amazing family memories. More quality time with your family. Traveling can be very stressful on a family. The long hours in the car are not always quality time when gets get tired, cranky or frustrated. Turning off electronics and just hanging out with your family is a big part of choosing a staycation. Think about these reasons to choose a staycation this year instead of a traditional family vacation! Not only will you save your budget, you’ll find yourself learning amazing new things about your area in the process. You can find amazing local deals on Groupon to make your budget stretch even further and additional staycation ideas for the Chicagoland area and other cities across the US on my other site Entertaining Chicago!